Having worked with Letha Drury of South Hill Gallery previously, I knew when she got in touch, something good was in store. Letha approached me regarding the hosting of the Breeders’ Cup at the historic Keeneland Racetrack in Lexington, Kentucky, so I jumped right in. Creating projects for the racing community is always exhilarating. Working in Lexington at Keeneland and with the enthusiastic surrounding community added energy and authenticity to our design concepts. South Hill Gallery is a custom gallery frame and printing business and a perennial supporter of the Lexington community, specifically those dedicated to the timeless sport of (thoroughbred) horse racing. Our collaboration allowed for insight and passion and with that came inclusion of a larger community. There were numerous particulars to this project. The first had to do with the layers of approval needed to make this project a success. While our client concentration was the gallery, this project also hinged on the Breeders’ Cup and Keeneland racetrack, with whom we wanted total collaboration and approval. Thus began the long process of licensing PR rights, working through three layers of approval and considering the aesthetic, logos, specifications, colorways and special requests. We had to consider all of the iconic and historical features, logos and emblems, in order for all parties to be represented and satisfied. Fortunately, the world of horseracing is ripe with historical insignia and the client had a clear design direction tempered by an insiders’ perspective helping prioritize the logos, emblems and embellishments. One of the more difficult aspects of this project was the need for the design to be timeless in subject, while at the same time able to capture a particular moment in time. Other logos, embellishments and history were equally important. The bugler, paddock, architecture of the stables, and racing accoutrements were all considered for the design. Prioritization, selection, and graphics are all crucial or the scarf design itself would suffer. The design must not only honor the subject at hand, but also be beautiful and captivating when worn, and tell a story when displayed. There was a need to combine two logos, creating something completely new and unique. When the two logos stood alone, they appeared to be exclusive of one another. A logo combining the event and the venue must be created every year. Similarly, the colors used for the logos, marketing collateral and websites may need adjustment in order to translate well as a wearable representation. A favorite part of any project is the friendships that develop throughout the design and production processes. 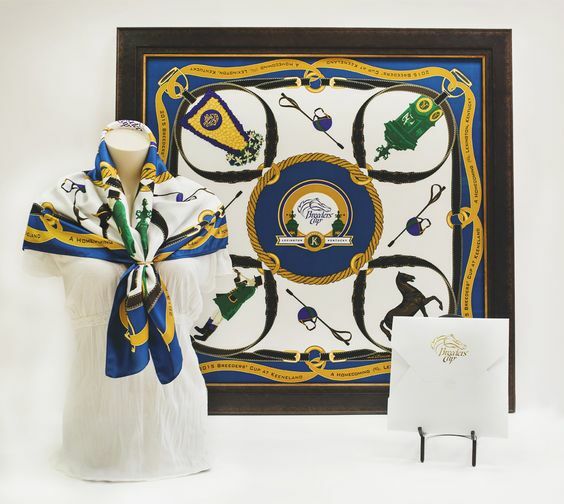 It was wonderful to be able to collaborate with talented professionals and South Hill Gallery, the Breeders’ Cup, Keeneland, and the Lexington community at large. Learning more about the racing community, race tracks, thoroughbred horses, and their owners helps me to appreciate the design and the project all the more. It is truly a collaboration of mutual respect, communication and appreciation. All agreed, the final result was fresh, crisp white with color, and stunning. It was historical, beautiful, thoughtful and honored all participants, organizations, and the racing spectators. We would love to hear your comments below in our comments section.